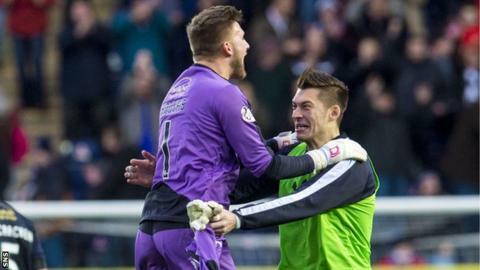 Danny Rogers saved Martyn Waghorn's stoppage-time penalty to give Falkirk a win over Championship leaders Rangers. John Baird opened the scoring for Falkirk with an early penalty, wrongly awarded by referee Willie Collum. Barrie McKay equalised with a low drive before the splendid Will Vaulks put Falkirk back in front after the break. Rangers created multiple chances but could not beat Rogers again - even when they were awarded a ridiculously soft penalty in the dying minutes. Rogers dived low to his left and tipped Waghorn's effort on to the post. Third-placed Falkirk's win reduced the gap on Rangers to six points, with Hibernian between them in second. This game was firecracker stuff right from the get-go. Danny Wilson hauled down Vaulks for that first penalty, but it was plain to most inside Falkirk Stadium that the foul was committed outside the box. Plain to all - except the officials. It was Collum who pointed to the spot, with encouragement from his assistant referee, and it was Baird who fired it home - his 14th goal of a fine season. Goalkeeper Wes Foderingham got a hand to it but could not deny Falkirk their dream beginning. Collum got stick from the home support in the aftermath, but Wilson's role cannot be ignored. He had no need to sell himself in the way he did. In doing so, he merely confirmed the feeling that Rangers have major issues at centre-half. Their vulnerability was a recurring theme of the day. Rangers responded impressively when a Nathan Oduwa cross was flicked on by James Tavernier to the feet of McKay. The midfielder thumped a shot low past Rogers. Short-lived joy for the visitors as it turned out. Peter Houston's team are on a terrific run. Coming into this one, they had five wins and two draws from their last seven games. They've scored an average of three goals per game in that run. Their confidence is sky high and they should have been back in front midway through the first half. This was a bizarre incident. Once again, Falkirk got in behind Rangers. The impressive teenager, Kevin O'Hara, curled in a goal-bound shot that was touched home by Baird while standing in an offside position. Baird had no need to help it on its way. A picture of remorse, he immediately apologised. Not that it bothered them unduly. Falkirk were deeply menacing at the beginning of the second half. Craig Sibbald forced a save from Foderingham then the excellent Vaulks rifled in Falkirk's second after more uncertainty in the Rangers defence. Soon after, Foderingham touched an O'Hara shot on to his post and then denied the youngster for a second time with another terrific save. Rangers were wide open and asking for trouble. The visitors rallied and piled the pressure on their hosts. Nicky Law hit the crossbar and Kenny Miller and Andy Halliday had efforts beaten away by Rogers. Falkirk held out. For them, this was a huge victory in what is becoming an intriguing season. For Rangers, more dropped points and more vulnerability. Match ends, Falkirk 2, Rangers 1. Second Half ends, Falkirk 2, Rangers 1. Penalty missed! Still Falkirk 2, Rangers 1. Martyn Waghorn (Rangers) hits the right post with a right footed shot. Penalty conceded by Blair Alston (Falkirk) with a hand ball in the penalty area. Corner, Rangers. Conceded by Mark Kerr. Attempt saved. Andy Halliday (Rangers) left footed shot from outside the box is saved in the bottom left corner. Foul by Scott Shepherd (Falkirk). Attempt missed. Andy Halliday (Rangers) left footed shot from outside the box is too high. Corner, Rangers. Conceded by Luke Leahy. Substitution, Rangers. Nicky Clark replaces Danny Wilson. Attempt blocked. Nicky Law (Rangers) right footed shot from the centre of the box is blocked. Attempt saved. Andy Halliday (Rangers) left footed shot from the centre of the box is saved in the bottom left corner. Attempt blocked. Martyn Waghorn (Rangers) left footed shot from outside the box is blocked. Attempt saved. Kenny Miller (Rangers) right footed shot from the centre of the box is saved in the bottom left corner. Nicky Law (Rangers) hits the bar with a left footed shot from the centre of the box. Substitution, Rangers. Nicky Law replaces Dean Shiels. Corner, Falkirk. Conceded by Wes Foderingham. Attempt saved. Kevin O'Hara (Falkirk) right footed shot from the left side of the box is saved in the bottom right corner. Kevin O'Hara (Falkirk) hits the left post with a right footed shot from the centre of the box. Goal! Falkirk 2, Rangers 1. Will Vaulks (Falkirk) right footed shot from the centre of the box to the bottom left corner following a corner. Corner, Falkirk. Conceded by Nathan Oduwa.